The group of Japanese drums NIKA TAIKO was born in Paris in 2015, created by Annabelle Liberge and Diana Cavalieri. They both come from artistic backgrounds and met in Wadaiko MAKOTO's school. They were formed by Mariko KUBOTA SALLANDRE from 2006 to the end of 2011. They then decided to practise taiko in a independent way, cherishing the values they have been transmitted to. Having attended the conservatory in Le Havre, she plays and composes piano since her childhood. She discovers and become passionated about Japanese percussions in 2009, during a journey in Japan and then listening to a concert of the group Kodo. She also practises Korean drums and recently started playing Kalimba and Sansula (African’s lamellophones). Filled with no limit curiosity for music and worldwide cultures, she loves composing and experimenting new tones in constant search for harmony. Creation is her main interest. She graduated from the International School of Mime Marcel Marceau in Paris, where she developed her skills in acrobatics, mime, dance, fencing and theater. She then directed her training in circus and contemporary dance. She discovers wadaiko in 2006. 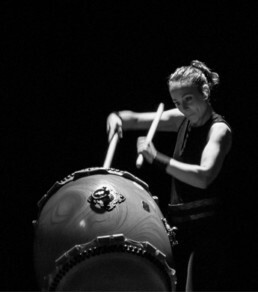 The elegance of movements, the richness of rhythms and the depth of the Japanese drum’s sound, have been the focus of her professional research. 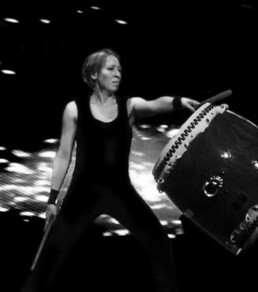 After playing in several groups, in 2015 she founded the group NIKA TAIKO with Annabelle Liberge.